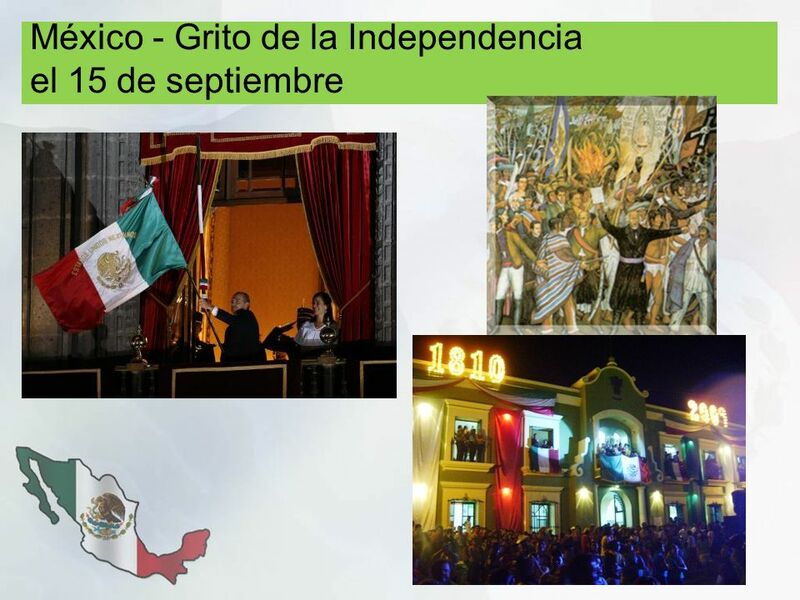 México - Grito de la Independencia el 15 de septiembre. 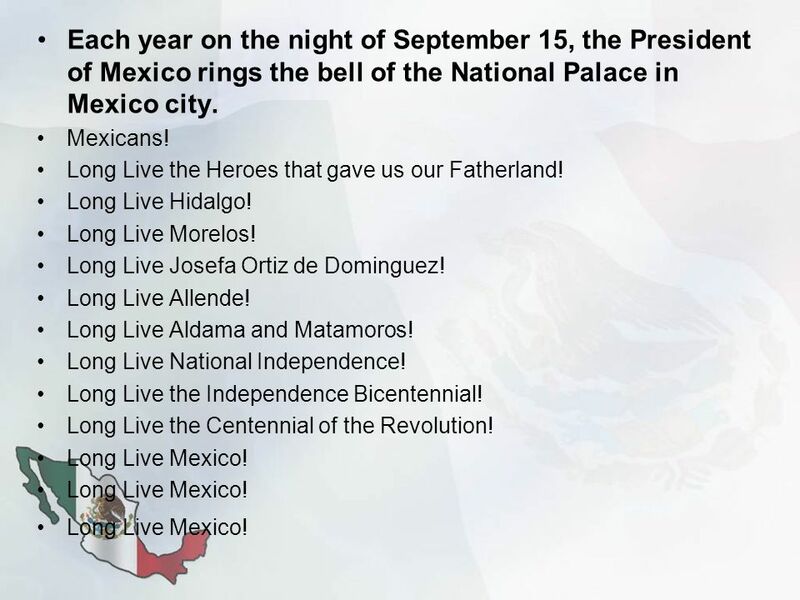 3 Each year on the night of September 15, the President of Mexico rings the bell of the National Palace in Mexico city. Mexicans! Long Live the Heroes that gave us our Fatherland! 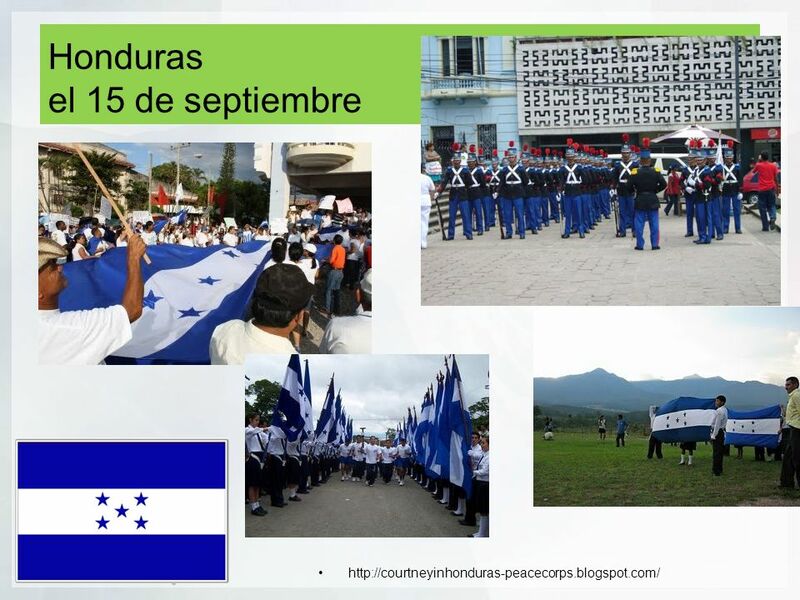 Long Live Hidalgo! Long Live Morelos! Long Live Josefa Ortiz de Dominguez! Long Live Allende! 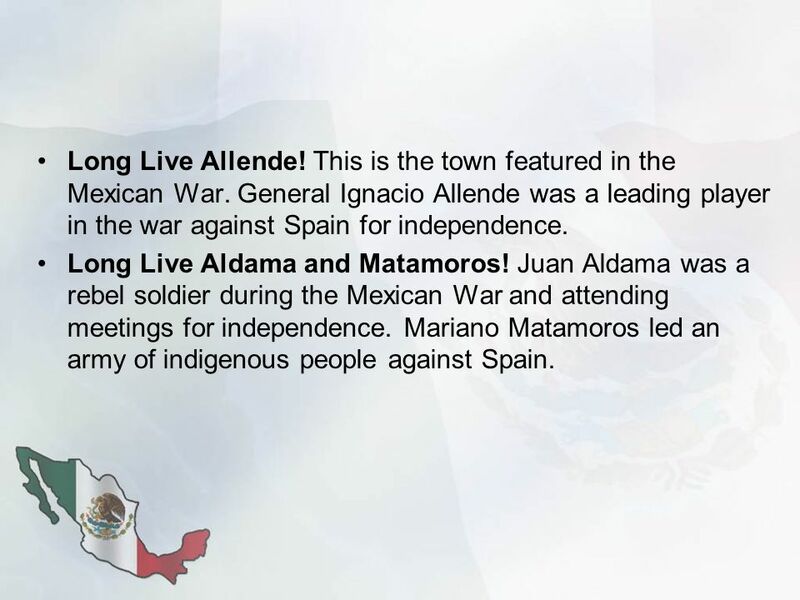 Long Live Aldama and Matamoros! Long Live National Independence! 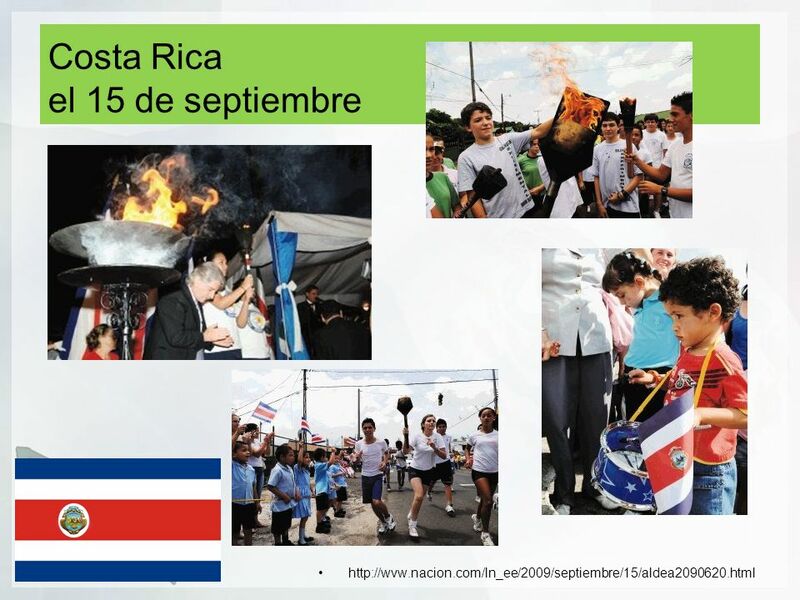 Long Live the Independence Bicentennial! Long Live the Centennial of the Revolution! Long Live Mexico! 4 Long Live Allende! This is the town featured in the Mexican War. General Ignacio Allende was a leading player in the war against Spain for independence. Long Live Aldama and Matamoros! Juan Aldama was a rebel soldier during the Mexican War and attending meetings for independence. Mariano Matamoros led an army of indigenous people against Spain. 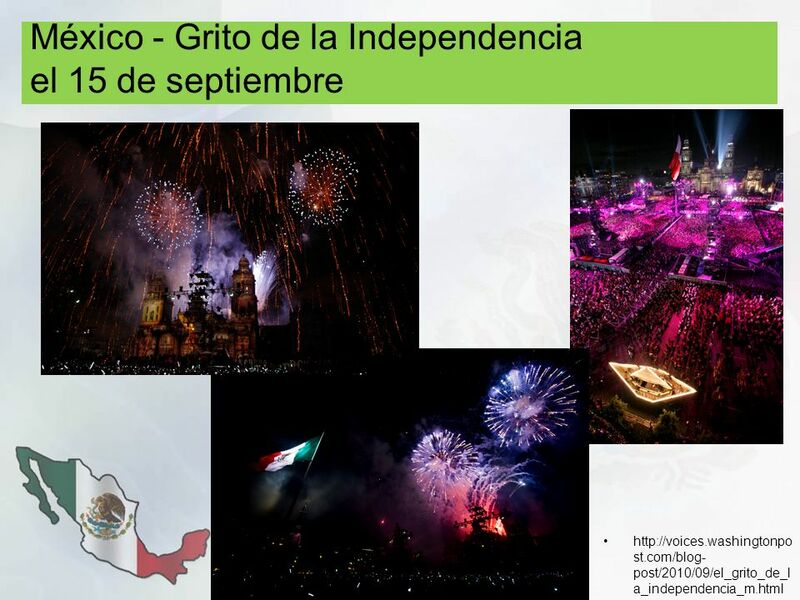 Descargar ppt "México - Grito de la Independencia el 15 de septiembre." 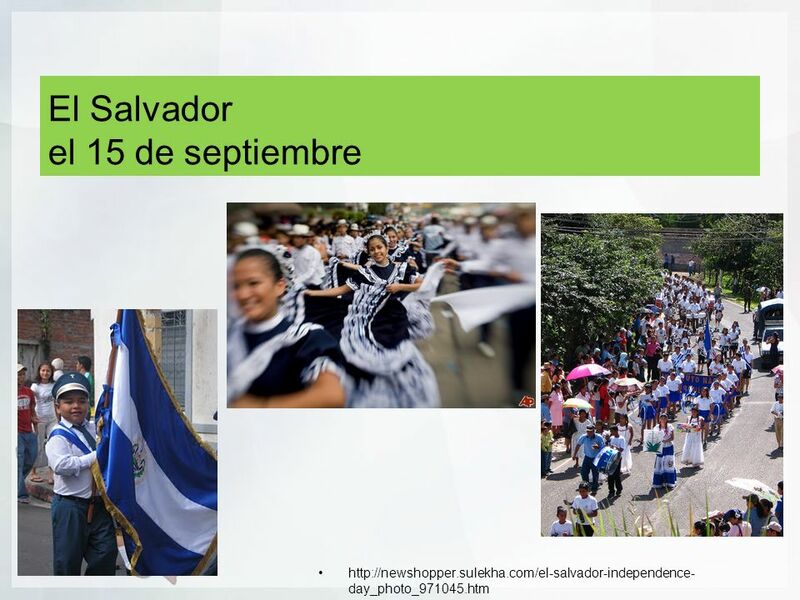 ALC 61 miércoles el 5 de mayo. objetivo Create 4 vacations scenes. SER Used to tell TIME and DATE. Son las dos y media. It is two thirty. Es el veinte de noviembre. It is the twentieth of November. 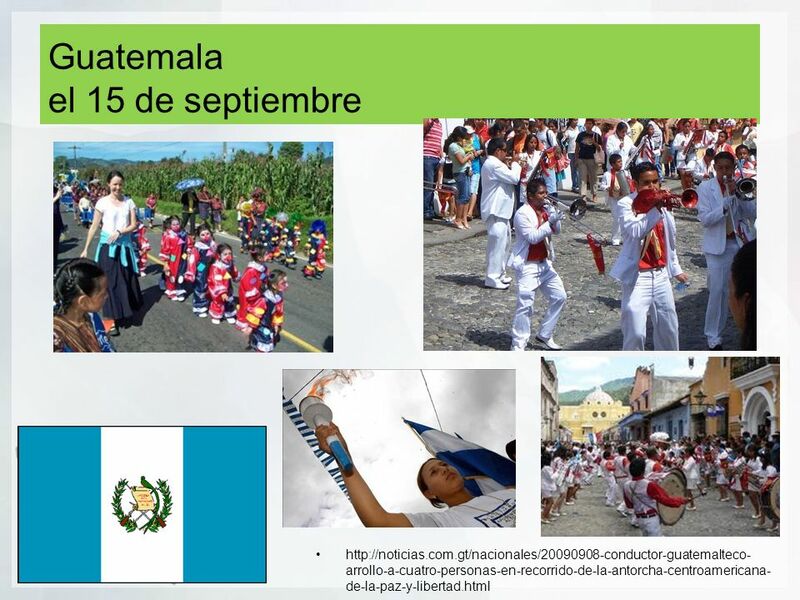 Cinco minutos: PERÚ Ethnic groups: Indigenous (45%) mixed background ("mestizo") (37%) European (15%) African, Japanese, Chinese & other (3%) Population. 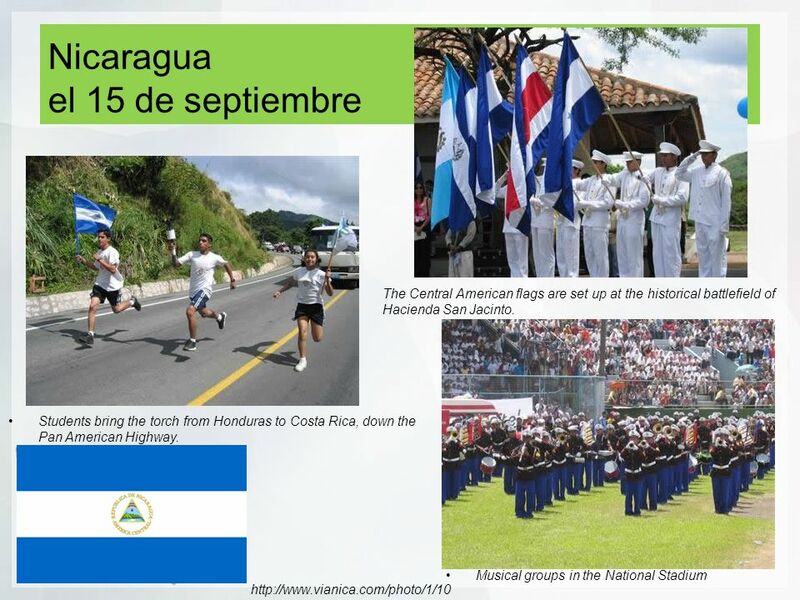 Central America is made up of seven countries: Belize, Guatemala, El Salvador, Honduras, Nicaragua, Costa Rica, and Panama. 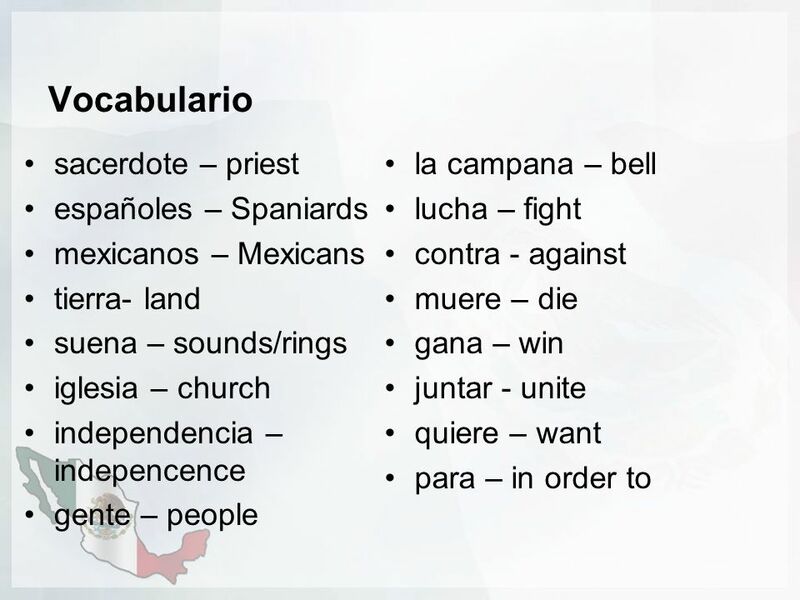 Spanish is the official language. Ch. 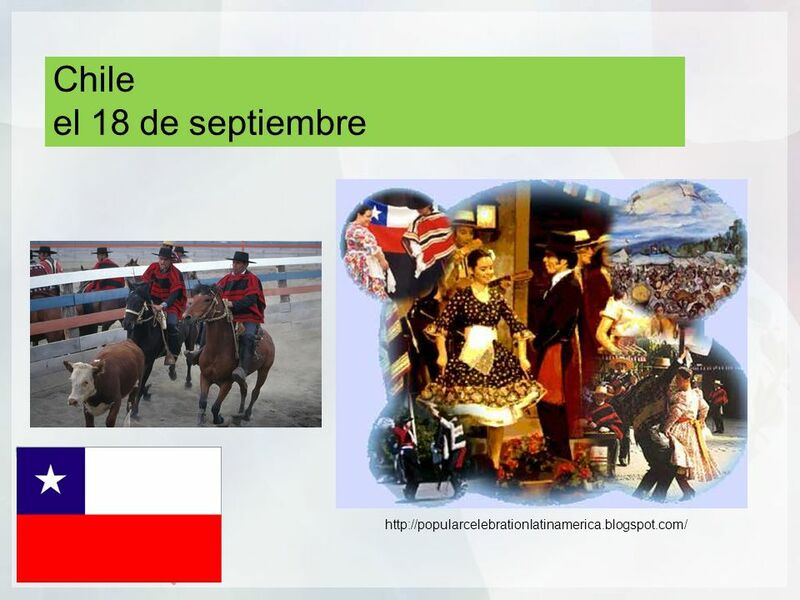 3 CULTURA. La Familia In Spanish-speaking countries, grandparents frequently live with their sons, daughters, and grandchildren. In Spanish-speaking. 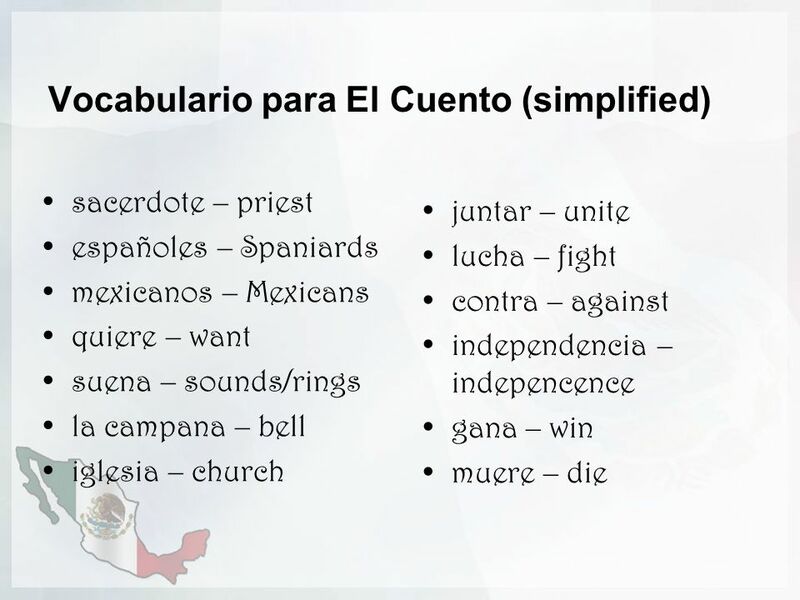 Subject Pronouns and Ser Español 1c Subjects and Verbs The subject of a sentence tells us who is doing the action. The verb tells us what action is taking.